I DON’T WANT ANYMORE SNOW! To a garden full of SNOW! Yup, this morning when we got up at six o’clock we had about two inches of snow on the ground. 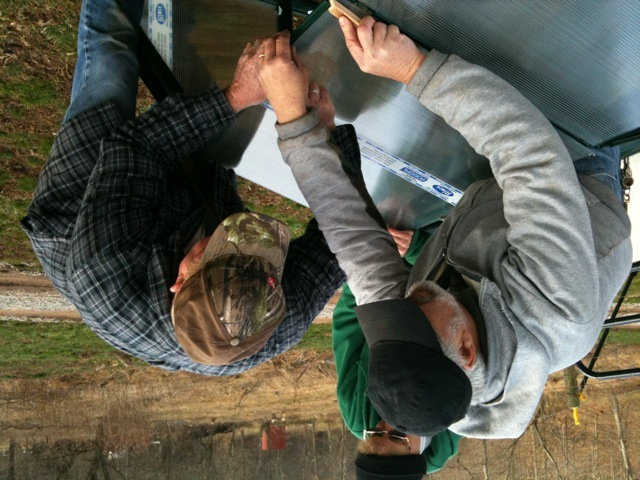 It was quite depressing to have to do those winter time chores again like sweep off the PV array. I decided to keep the chickens confined today and they didn’t seem anxious to bust out of the coop hatch like they usually do. I think the rooster must have taken one look out of the window of their door and said, “Heck ladies lets just stay in and keep each other warm today. You can fluff the straw and clean up some of this corn mess on the floor when your done layin’ eggs.” I think if that were true I would find one defeathered, henpecked, simpering rooster by the afternoon. But in true Spring fashion the sun came out and melted the snow with the temps getting up to about forty degrees. Tonight and tomorrow night will be down in the teens. Burrr! Yesterday Sonny pulled the guinea house out of the garden. They don’t like it anyway and it will soon become a piglet shelter. Way, way in the back of the property. We want to try our hand at raising our own hog for the freezer this winter instead of going to the livestock auction like we did last year. Like everything here at PHF it will be a test. 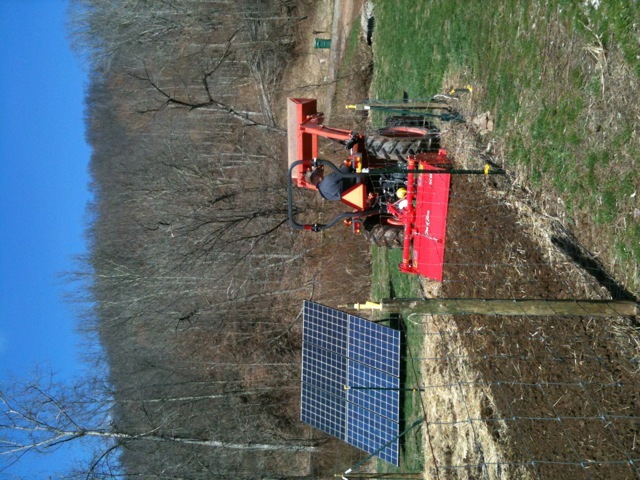 We also plowed the garden yesterday. The soil appeared dry enough. We are no experts but from the description in our gardening book it seemed right. We had to dig out some big chunks of wood that the logger had buried before we bought the property and of course there were numerous stones that had to be picked out. We put the stones in a pile and then dumped them into a puddle near the driveway entrance. At least that will help keep it from getting any deeper. There is still hope for the greenhouse. The Rion company emailed us a parts list which was a big help. Now we were able to decipher what parts needed to be replaced and their corresponding numbers. We should find out in a few days what the replacement parts will cost us. It is only the beginning because I am sure the replacement list will grow as we start to put the pieces back together. John and Carol bought a new RVT. They got a nice Kobota side by side, so we bought their old Arctic Cat. Its been around the block a few times but its still got a lot of life left in it and we are glad to have it. Well Sonny and I assessed the damage to the greenhouse today and was able to put a few parts back in place. We found out that we can order new parts from The Rion Company for the pieces that are completely unusable. I think we will be able to get it back to a fair assemblage of what it once was. Until then I have repotted my seeds and placed them in the window of the mudroom where the sun shines and heats the room for most of the day. We will probably start the ordering process next weekend. The greenhouse will need a lot of TLC but at least we won’t have lost everything. And this time we will have it so anchored down that if the world blew up it would be the only thing standing and it would be our new house. 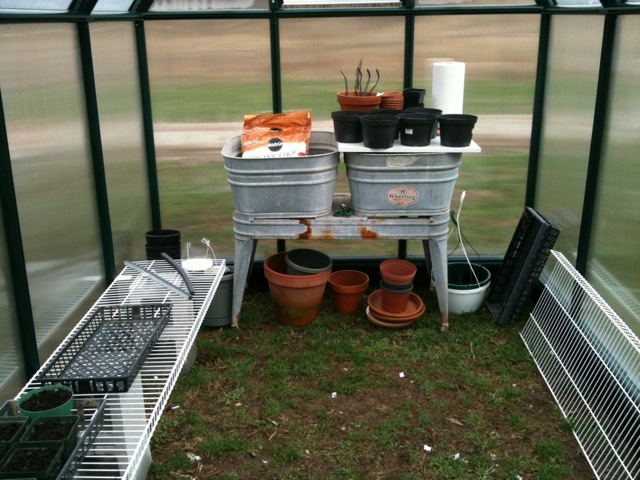 I know some of you commented that you were envious of our greenhouse, but now you don’t need to be. We had a huge storm come through today with a wind that blew through like a hurricane. 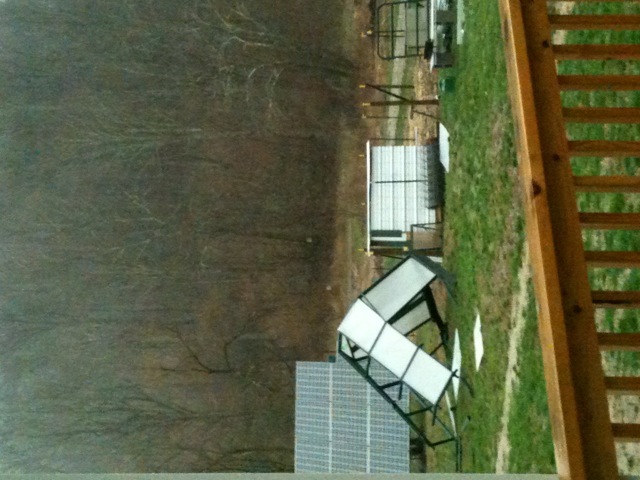 It destroyed our little greenhouse, blowing pieces of it to parts unknown. I went out later and assessed the damage. Parts were strewn around the farm as if a bomb had been let off. The panes were blown across the creek and some floated down the creek. I don’t know if it is able to be repaired. Most of the frame structure is cracked and broken in two and green shards of plastic are visible in the grass. At least nothing else was damaged. I can repot the seeds and yes I’m upset, but you can’t cry about what happened. Whats done is done and in the scheme of things the loss of one little greenhouse is nothing compared to what the Japanese and others have recently lost around us. I am sure we will do something to replace it eventually. 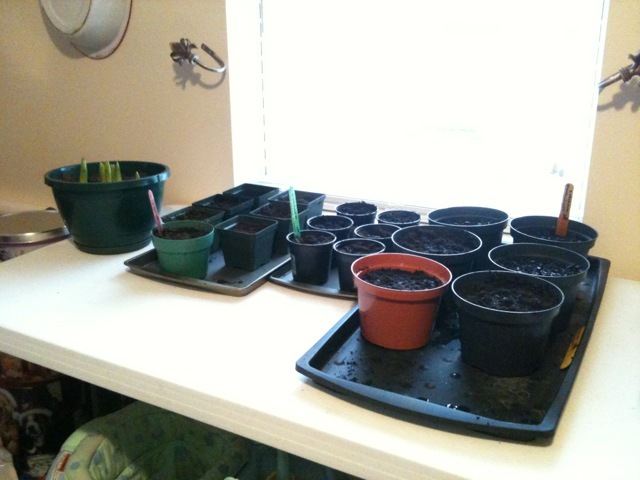 With the greenhouse set up there was no excuse not to start planting some seeds. I washed out last years dirt remnants from my plastic pots, most of which were left overs from seedlings we had bought from a nursery last year. This year we want to try to start all our own seedlings. Now I am no expert at this and can’t remember what I had for breakfast let alone the time frame for planting, so I followed what Carol has started. I guess at some point the information will eventually seep into my brain cells. Maybe I need a little brain fertilizer to grow some more cells. Actually I just need to take the time to write everything down to use as a reference for next year. You can get information on the internet and in books but sometimes the experience of seasoned gardeners in your area works best. I set up my workspace which is an old double wash tub and stand that we bought at the flea market last year. I found a spare shelf that we had taken out of a cabinet and placed it across the top of one of the wash tubs. It covered the top of the tub perfectly and works well as a table top, plus I can stash some supplies underneath in the tub for storage. The other wash tub works great for holding my bag of organic potting soil. That way I don’t have to bend down or lift the bag to scoop the soil out. 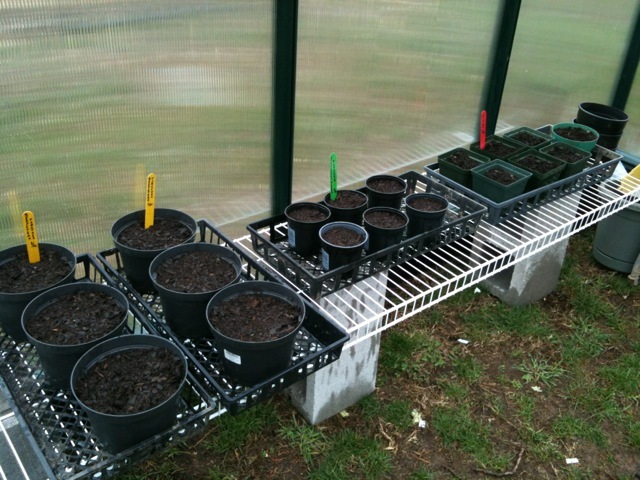 Today I planted Beefsteak tomatoes, California Wonder peppers, and Lima beans. The Lima bean seeds were saved from last years crop. I didn’t add any fertilizer to the soil because it already contains a sufficient amount to start the seedlings. I bought some colored popsicle sticks at the craft store to tuck into the pots as labels. A shower of water, some sunshine and warm temps should get these seeds sprouting. Hopefully it stops raining long enough for the garden to dry out and Sonny can till it. One last note. While I was gone on vacation we lost one of our precious little hens. It’s possible that she is setting on a hidden nest somewhere, but we have not seen hide nor feather of her. Unfortunately losing some of your chickens to predators is part of farm life. Its a tough smack of reality sometimes but she had a good life here at PHF. She had shelter, plenty of food and water, love, and the freedom to roam about the farm enjoying her simple chicken life to its fullest. Isn’t that the kind of freedom we all want? After months of sitting in boxes in our mudroom the greenhouse has finally been assembled and put into place next to the garden. We started on it Saturday afternoon and finished it up on Sunday morning. The weather forecast for both days was good and we took advantage of them to get the job done. Spring weather can be finicky, like today, stormy and rainy, and although warm in the upper sixties this afternoon, its supposed be cold and nasty by end of the week. As always our life savers John and Carol were here to lend a helping hand. Carol did an excellent job following the printed instructions and leading us step by step. John and Sonny did the grunt work snapping the pieces together like a giant Lego puzzle. They work really well as team and when we hit a few snafus they always came up with a solution. Usually because they didn’t listen to the given instructions and got ahead of themselves. All you ladies out there know what I’m talking about, but we love them just the same. I felt a bit out of my element as my hands did not have the strength to snap some of the pieces together which can be very frustrating when you want to help. 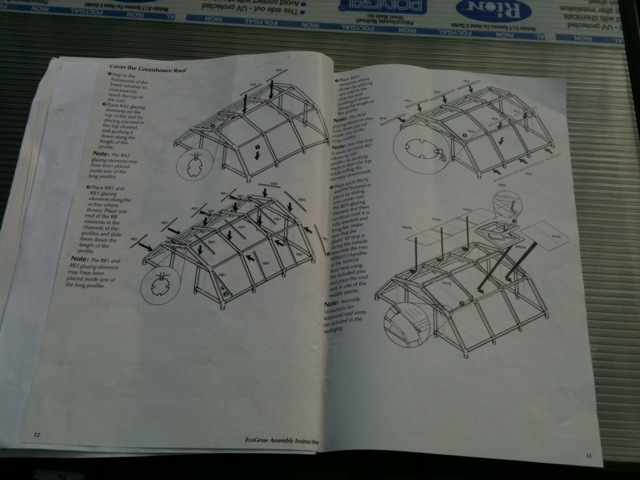 So Carol and I designated ourselves to finding the numbered parts and laying them out for the guys as they needed them. We were also the coffee hostesses keeping the guys going with the elixir of life. Gotta keep those men happy. 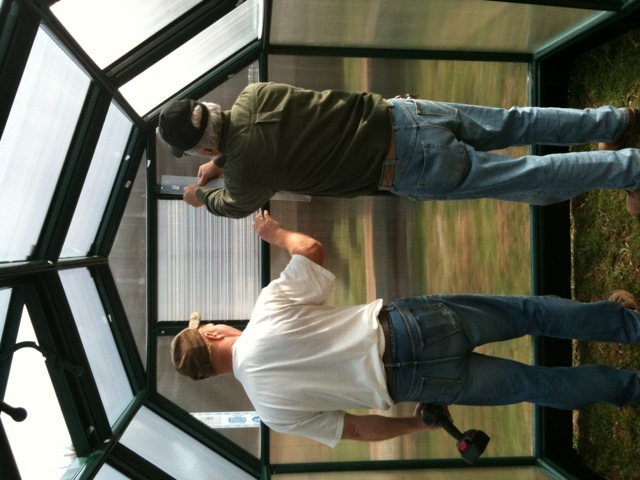 Putting in the louver window. 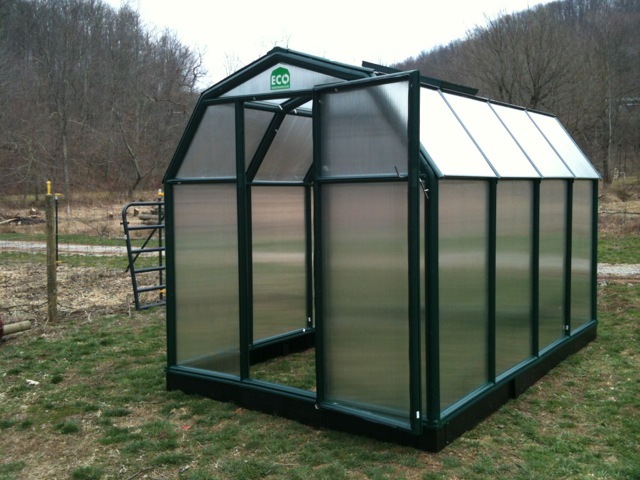 All in all the construction of the greenhouse was pretty simple. Basically you build a frame and put the UV protected panes in the designated grooves. Everything is numbered. The only real problem we ran into was with the construction of the base. We bought a slightly larger model than the standard size. The manufacturer uses a standard sized base and then adds extension pieces as needed, which was fine except for the fact that some of the holes did not line up correctly when the extension pieces were added. Sonny and John figured out a solution and everything seemed to fit together properly by drilling a few holes and some extra screws. It feels good to have that big job finished and the boxes out of my mudroom. We just need to add a few finishing touches. A couple of metal rods to anchor the greenhouse down, some gravel spread out to make a floor and a row of shelves will put it in shape to start incubating some seedlings for the garden. It’s time to get dirty. I know, I’m sorry, I haven’t put up a blog for the past few weeks. There is a very good reason for that, I was visiting my family in Delaware and forgot to take my laptop with me. I had a great visit with family and got to see almost everyone. The downside to it all was that Sonny was in Okinawa when the earth quake and tsunami hit Japan. I got a phone call at about four o’clock in the morning from him letting me know that he was ok. He wanted to give me a heads up before I got up that morning and saw the catastrophe spread across the news and freaked out. At that time Okinawa was bracing for a possible tsunami to hit them. Of course I couldn’t go back to sleep and I had to find out what happened. We were all glued to the TV for days and were horrified at the pictures coming across the screen. Sonny had been in Tokyo Japan just the week before and all flights from Okinawa have to layover in Tokyo before heading to the States. I was afraid he might have a problem getting out of there. Then the problems with the Nuclear reactors started. It was horrible not knowing if he would get out, but thank God he was able to get a flight out that following Monday. I’ve a mind to hog tie him and not allow him to leave Pot Hole Farm ever again. It was a nerve racking and stressful week, but I am glad that he is back home where he belongs. Please keep the people of Japan in your prayers. I’m afraid they may need them for a long time to come. I’m grateful that my husband is safe and sound, but there are many who are missing their loved ones and have lost everything. I won’t forget them. The weather was very mild today in the forties, the sun was shining and there was a nice clean breeze blowing. It was a great day to be outside. I even washed a load of sheets and hung them out on the line for the first time since last fall. Of course I have washed them since then, I just hadn’t used the clothesline because it was too cold. Thought I needed to clarify that for all you jokesters out there who would have commented that I hadn’t washed my sheets all winter. Have to watch you guys. John and Carol brought over a truck load of donkey manure this morning to spread on the garden. That should get the soil going. John shoveled it off Festuses flatbed and Carol and I spread it through out the garden. The guineas eyeballed us through the fence, keeping their skinny necks stretched straight up with their clown painted heads cocked so as not to miss anything . It didn’t take any time at all to finish the job and we went inside to enjoy a cup of coffee. By the time John and Carol left to go take care of their own farm chores, the hens had already found the garden and were happily doing their chicken dance through the manure. They flapped their wings and kicked up their yellow feet in a jig as they scratched and searched for goodies. 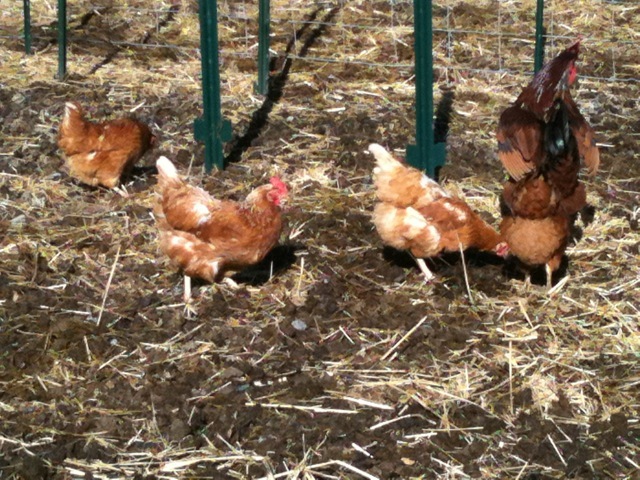 Carol and I should have just let the chickens spread the manure and saved ourselves some work. Flap your wings and kick your feet, bob your head and peck your beak. Soon we’ll till the garden mixing the rich manure into the garden soil. For now though we’ll let it sit and allow the nutrients to seep into the soil with the rain and of course the chickens and guineas will mix it up as well. The breeze did its job today and dried my sheets. Oh, the fresh scent of air dried sheets, how I have missed that. Spring is peeping around the corner. 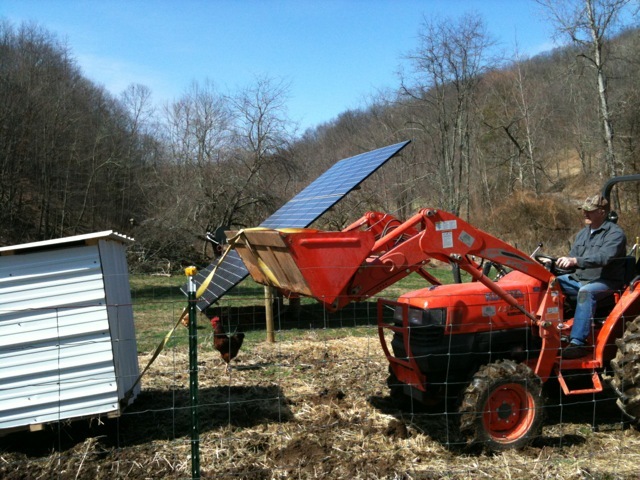 You are currently browsing the Off-Grid in West Virginia blog archives for March, 2011.